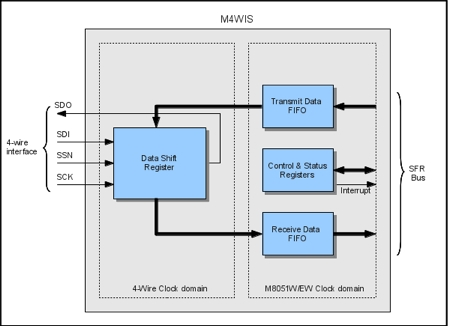 The M4WIS adds four-wire slave capability to the M8051W and M8051EW designs that is compatible with the I2C Fast protocol. Clock stretching can be achieved under register control in order to implement flow control. Use of standard synchronous design methodology makes this core simple to integrate into both ASIC SoC and FPGA designs.